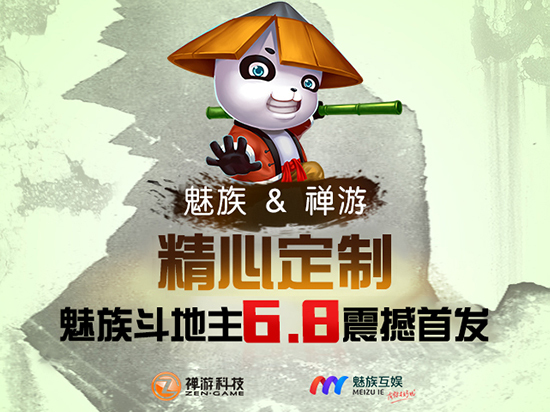 MEIZU Landlord Fight, elaborately customized by MEIZU GAME & ZEN-GAME was officially launched Today on June 8th! Considering the brand strength and lure of the game itself, MEIZU Landlord Fight is absolutely the game that recreational games players won’t want to miss! It’s well-known that MEIZU GAME has a strong distributing ability. ZEN-GAME is also the top company in mobile phone chess & cards games. Their cooperation can be seen as two outstanding companies collaborated. Let’s give a brief introduction of ZEN-GAME. ZEN-GAME is a comprehensive service provider that focuses on building a world class recreational competitive & entertaining platform. It focuses on developing and issuing mobile phone chess & cards games and elaborate recreational games. It has already launched more than 40 mobile phone chess & cards games. It works together with all big mobile phone manufacturers in China, App stores and other channels. Its registered users have exceeded 100 million. Monthly active users have surpassed 10 million. ZEN-GAME is classified as the domestic first-class mobile phone games developer and operator. ZEN-GAME has deep collaboration with some mobile phone manufacturers. It has seasoned R&D and operation experience. Its specialized ability is far beyond its peers. MEIZU GAME and ZEN-GAME’s collaboration on MEIZU Landlord Fight will bring a strong storm into the field of chess & cards games. It changed the traditional way of fighting the landlord and integrated creative modes, which won’t make you tire of playing. Besides the classic way of playing, it has added round-advancing mode, single device mode and matches mode. You will enjoy the best experience of playing landlord fights with these all new story-related round-advancing that will challenge even expert players. You will fall in love at first sight of the refined cute pictures of MEIZU Landlord Fight. Characteristic UI design, no traditional landlord fight characters factors, King Kong panda showing up. Playing landlord fights with these cute and cool, fresh and healthy pictures brings a refreshing experience. Activity One for installing：Single-wheel scooter, MEIZU PR06, Note3, MEIZU EP51, JD gift cards. Activity Two for charging: MEIZU PR06, Note3, JD gift cards, mobile phone calls-fare cards, game beans. Activity Three for starting to play the game: DJI drones, Xbox one, Note3, JD gift cards. Activity Four: activating codes for 200K people. With the lure of different ways of playing landlord fights, plus all these gifts, it’s believed that MEIZU Landlord Fight will bring you unprecedented surprises!